Hey River of Lifers! Our Costa Rica team dubbed the, ‘Frozen Chozen,’ is arriving today to begin a week-long project in Nicoya. We will be hard at work until Saturday, February 2. We are being joined by teams form Oregon, Alaska, and southern Costa Rica. Our team is super psyched for an incredible week of working hard, laughing harder, sharing God’s incredible love, and building some awesome relationships! And yes, in case you were wondering, it is gloriously hot… it’s 88 degrees! We’re so sorry we have to miss the coldest week of the year! We have six River of Lifers participating this year and we ask for your prayers this week for Harold, Rod, Stephanie, Heather, Eric, and Rob. Some of their prayer requests are for everyone’s safety, health, and team unity throughout the week. They’re also praying for humility and boldness, for the eyes of Jesus, and for continued dependence on God. 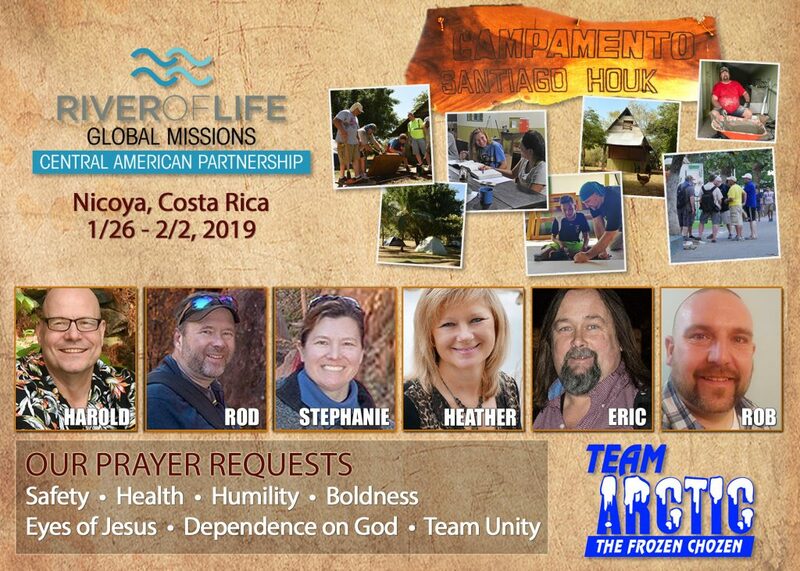 Please join us in praying for the ‘Frozen Chozen’ this week as well as the rest of the teams helping in Nicoya, Costa Rica! Check out this video from some of our global partners: Getting ready for a great week at Campamento Santiago Houk. The teams from Alaska, Minnesota, and Oregon arrive tonight and tomorrow. Interested in serving or volunteering more in 2019? Check out the serve page of River of Life’s website and see all the different ministry areas and how you can get involved. Want to find a ministry area to serve in that’s the best fit for you? Add your gifts, passions, abilities, and personal style to your profile on MyROL using MyFIT! Want to learn more about our global and local missions trips? Keep an eye on River of Life’s “Missions” page. When new outreach opportunities come up, they will be posted there, along with sign up information and the dates and times of informational meetings.